Built on empirical material from field study conducted between 2011 and 2014 and based on a qualitative methodology, this paper aims at highlighting the struggles for power within the appropriation of commercial streets inside two transnational trade centralities, al-Muski in Cairo (Egypt) and Medina J’dida in Oran (Algeria). It demonstrates that street vendors have known how to benefit from the weakening and/or the weakness of urban authorities and have been able to negotiate their place and their presence in the public space. First, the paper presents the general development of street vending in the two transnational commercial centralities. Then, it analyses the unsettled and often tense relationships between street vendors and urban authorities, where the control of public space and, through it, the control of the city at large is at stake. Finally, it highlights the complex power relationships between street vendors and official traders who compete for marketplace access. In summary, while facing an ever-changing environment filled with contradictions, street vendors constantly have to negotiate their place in these two marketplaces, and through them, in the city. This article benefited from the very useful proofreading of Dr Alex Jeong-Seok Lee and Dr Clémence Montagne. 1Street vending activities are a day-to-day reality in the Middle East and North Africa region (World Bank 2014). In MENA cities, “street trade is an increasingly important component of urban informal economies, and a crucial livelihood strategy for the poor and very poor” (Brown et al. 2017: 284). Its economic informality is characterized by on the one hand, “the lack of formal business registration, taxation or licensing documents” and, on the other hand, “the operation on public or private property that is not legally designated for the practice”, even though “there is a continuum between formality and informality” (Kafafy 2017: 221). Street trading is also one of the most visible occupations in the informal economy (Roever and Skinner 2016), as it takes place in public space, which is subject to frequent repression from urban authorities and police (Brown 2006, 2017, Blot and Spire 2014). In North African cities, street trade activities have been developing for the past twenty years, as a response to economic crises (Daguzan 2009, Talahite and Hammadache 2010, Gana-Oueslati and Moisseron 2010) and reduction in employment opportunities, especially for the youth (ILO 2015). They have transformed cityscapes progressively and deeply. With political turmoil from the end of 2010 known as ‘Arabic springs’ that destabilized and even swept away some of the traditional state authorities in the region, street vendors’ stands have grown dramatically in main cities’ streets, and more especially in city centres. In Cairo’s case, in Egypt, this phenomenon has known a spectacular expansion in the very centre of the city after the revolution (Abdelrahman 2013, Nagati and Stryker 2013, Brown et al. 2017, Kafafy 2017), raising the question of the right to the city and of streets usage. In Algeria, street vending activities have spread through cities’ streets since the 1980s. Additionally, the political unrest in the MENA region has impacted indirectly Algeria (Volpi 2013, 2015), and street vending has encountered a similar spatial expansion in city centres since 2010-2011. Oran, the second most important city in the country, has thus witnessed the development of these informal activities in its central districts. 2Besides flowing into city centres, street vendors have also settled and developed their activities into other types of neighbourhoods, whose development has been flourishing since the end of the 1990s: places, which are home to urban markets specialized in globalized made-in-China goods’ selling and which belong to the inconspicuous geography of globalisation (Pliez 2007, Choplin and Pliez 2015). These areas have become centralities of transnational trade between North Africa and South-East Asia since the end of the 20th century (Pliez 2012, Belguidoum and Pliez 2015). They are today the gateway of globalized items for the bottom of the pyramid market (Prahalad and Hart 2002), that is to say, “the poorest groups, seen as significant niche markets for consumption, production, and wealth” who benefit from a “limited prosperity” (Darbon 2013: 37). In Egypt, with a population of 90 million, this market potentially gathers 40 million people (Pliez 2007, 2012). Algeria, with more than 40 million inhabitants, 65% of whom are urban dwellers, also represents a very large market of potential consumers. In Cairo, the role of commercial centrality applies to Ataba area and its al-Muski market (map 1), an important part of the historical and medieval heart of the capital (Madœuf 1997, Bouhali 2016). In Oran, this function is assumed by Medina J’dida (map 2), the previous indigenous centrality before Algerian independence (Bouhali 2016). Street vending has accompanied the urban and commercial boom of these two marketplaces. It has thus tried to grab some of the important commercial dynamism that prevails in these two marketplaces by locating itself at the heart or in the margins of these two central urban markets and by appropriating massively the streets. Map 1. Al-Muski, a transnational trade centrality in Cairo, Egypt: location map. Source: author, 2014, edited 2018. Map 2. 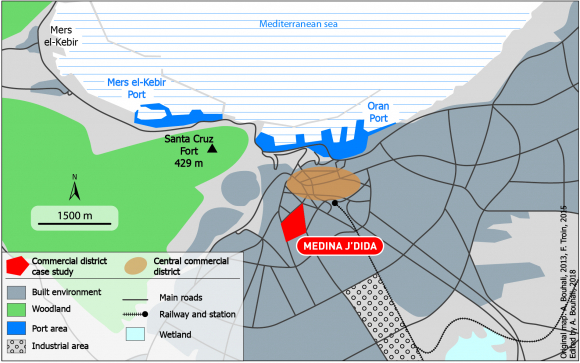 Medina J’dida, a transnational trade centrality in Oran, Algeria: location map. Source: Original Map: author, 2013, F. Troin, 2015, edited by the author in 2018. 3However, the development of street activities in public space have created tensions, first, between street traders and urban authorities. Indeed, both in Algeria and in Egypt, despite two very different political contexts, state involvement in urban production and management is very strong, as a policy-maker, law and regulations producer and urban planner (Signoles et al. 1999). Public space is seen by urban and state authorities as the real and symbolic seat of their power (Berry-Chikhaoui and Deboulet 2000, Dris 2016). As the sociologist Dris writes, “Public space is today perceived as a property belonging to the state and not to the community. In that sense, the use of public space strongly reveals the relationships between the state and its population” (Dris 2002: 184), and, in our two cases, between the state (represented by urban authorities) and street traders. Moreover, the boom of informal trade activities has run counter to the authorities’ will of urban order by modelling and transforming the cityscape from below. What is at stake in these two situations is the question of power in urban organisation and space control of the commercial street, revealing public space as a contested territory (Graaff and Ha 2015, Brown 2017). On the one hand, the street vendors whose activities have deeply and visibly modified the commercial centralities, and, on the other hand, urban authorities who try to face this public disorder and re-establish their control onto the city, despite the actual fragility and the variability of their power. Besides the rivalry between urban authorities and street vendors, the latter have to compete with or against other agencies inside the very marketplaces: the official traders, who often consider themselves as the informal owners of the commercial streets and who try to regulate their occupation and their usages. Consequently, street vendors have to negotiate their place in transnational trade districts towards two different types of agencies who both assert power on the commercial city and its streets. Street vendors’ activities and their spatial expansion depend on the unequal balance of power while revealing it. 4This paper aims at highlighting the struggles for power within the appropriation of commercial streets inside transnational trade centralities in Cairo and Oran. It demonstrates that street vendors have learned how to benefit from the weakening and/or the weakness of urban authorities in two different political contexts and have succeeded (maybe temporarily) in the illegal appropriation of the street. Gaining access to the commercial centrality of transnational trade for street traders means the possibility of benefitting from the former’s dynamism, as well as an opportunity to access some of the limited wealth that is produced (Steck 2006). As a result, street vendors have thus been able to negotiate continually their place and their presence in the public space. This article is also an attempt to participate in the development of research on an area that seems to be set aside from research on street trade in the global South (Brown 2006, Skinner 2008, Roever and Skinner 2016) since the research considering street trade in North Africa is very scarce, and to draw attention to arrangements between institutional and informal actors. In the case of Cairo, it complements recent studies that focused on the effect of conflict in trading economies (Brown et al. 2017), on the changing power relations and the power struggle between traders and the altering state (Kafafy 2017) and on the question of the street traders’ right to the city (Nagati and Stryker 2013), by shedding light on the traders’ influence on commercial cityscapes and their impact on the urban fabric and public spaces. 5This article relies on empirical materials collected during doctoral research in Algeria and in Egypt (Bouhali 2016) based on ethnographic methodology (Olivier de Sardan 1995). 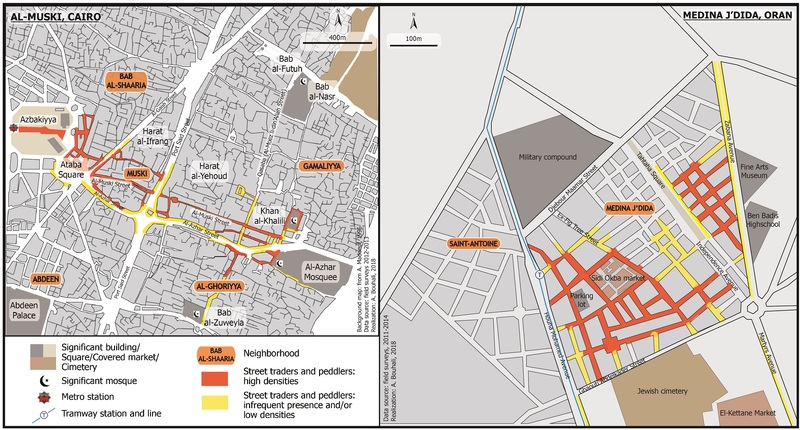 During two periods of fieldwork in Cairo (February-April 2012, March-July 2013) and four periods of fieldwork in Oran (November 2011, July 2012, February 2013, March 2014), observations and cityscapes’ analysis were used in order to understand the spatial and social organisation of commercial streets and activities, the relationships between street traders and urban authorities, and between street traders and ‘official’ merchants. Conducting a survey in the commercial streets, and especially when this survey concerns street trade, an activity condemned by urban authorities both in the Algerian and Egyptian contexts, was more precarious, thus we were limited mostly to rough estimations. Semi-directive interviews were conducted with official traders, alone and with the valuable assistance of interpreters in Cairo’s fieldwork. Fewer semi-directive interviews were realized with street traders, since, because of their precarious situation, had less time for long discussions than official and settled traders. In al-Muski’s streets, we succeeded in realizing five semi-directive interviews with street traders in front of their booths. In order to overcome this deficiency, we shared regular informal discussions with numerous street merchants in Medina J’dida and al-Muski, as a regular client of the two urban markets. We completed these inquiries with the collection of press material and analysis in the Algerian French-language press and the Egyptian English-language press. 6The first part of this paper details the development of street vending in transnational commercial centralities and its recent explosion within the framework of transnational trade’s development. The second part analyses the unsettled and often tense relationships between street vendors and urban authorities, where at stake is the control of public space and, through it, the control of the city at large. The third and last part highlights the complex power relationships between street vendors and official traders who compete for marketplace access, a situation that reveals conflicting usage of commercial space. In summary, while facing an environment filled with contradictions, street vendors constantly have to negotiate their place in these two marketplaces, and through them, in the city. 7Over the last two decades, street vending in Cairo and in Oran, and more generally in Egypt and in Algeria, has experienced an impressive growth, highly visible through cities’ streets, a spatial and numerous expansion reported by the national media as catastrophic most of the time. In the Middle East and North Africa, informal employment represents 45 per cent of non-agricultural employment (Chen et al. 2016); moreover, informality rates are very high particularly among youth (Angel-Urdinola and Tanabe 2012, ILO 2015). Within the considerable diversity in terms of occupational groups and activities, street vendors may be the most visible, though national data regarding this sector is scarce and city level statistics even rarer (Skinner 2008). In Algeria and in Egypt, recent street trade development is also to be related with the booming of transnational trade of made-in-China goods, which has been a substantial livelihood as well as a small gateway to professional trade. 8Street vendors have been very visible in Algerian and Egyptian urban space for the past decades, but the total number of people who work as street vendors is hard to come by (Roever and Skinner 2016), in particular in these two countries, where statistics and research are sparse, and the figure do not refer to street trade. In 2013, an International Labor Organization study, cited by Brown et al. (2017: 289), estimated that “informal employment forms 51 per cent of the country’s non-agricultural employment, employs 8.2 million people, and includes 7.6 million men and 572,000 women (2009 data) (…) Informal employment is estimated by the ILO to contribute 16.7 per cent of Egypt’s GDP (2008 figures)”. In Algeria, in 2010, out of a population of 8.6 million employed in non-agricultural sector, 3.92 million are employed in the informal sector. One in four jobs in informal employment rested on trade, hotels and restaurant industry, including de facto street vendors (Souag et al. 2016). According to Souag and Assaad, “informal employment increased from 21.9 per cent of total employment in 1997 to 43.8 per cent of total employment in 2007. By 2010, it had reached 45.6 per cent” (Souag and Assaad 2017a: 2). It “seems to provide traditionally an ‘anti-crisis’ strategy: it appears to be a possible opportunity of remuneration both for new labour market entrants and unemployed” (Souag et al. 2016: 5). This growth can be explained “by the inability of the formal sector to create enough jobs for the massive influx of young new entrants onto the labor market” (Souag and Assaad 2017b: 3), a statement that applies to the Egyptian situation. In Algeria, every fourth young adult between 16 and 24 year-old was officially unemployed in 2013 (ONS 2014, Benhabib 2014). Egypt’s situation was similar, with an unemployment rate of young adults between 18 and 29 year-old estimated at 23.7% in 2013 (Cairo Post 2014). 9Whereas these studies do not relate to street trade, “it is clear that the informal economy is significant and complex” both in Egypt and Algeria, “and that street trade is likely to be both a crucial source of jobs and an important mechanism for facilitating informal sector trade more broadly” (Brown et al. 2017: 290). Youngsters have found street vending as an interesting alternative to their precarious situation, an activity that allowed them to gain access to a social status and a decent livelihood (Dris 2002, ILO 2015). These analyses have been confirmed by the street traders we interviewed during our fieldwork, where a majority of them were younger than 30 years old, especially in Egypt. To them, working as a street trader was a way to get a decent living because they could not find formal wage employment, including youth with university degrees. In Algeria, development of street trade starting in the late 1980s (Peraldi 2001) has accompanied the spreading of trabendo or “suitcase commerce”, realized between both sides of the Mediterranean Sea. As the sociologist Dris observed at the beginning of the 21st century, “from now on, informal trade, in its most spectacular shape, fills streets until the very front of residential buildings” (Dris 2002: 280). Eventually, in the last decade, the widespread development of street trade activities through city centres, specifically inside commercial neighbourhoods, has been directly related to the success of transnational trade in North Africa. 10Street vending in transnational trade markets is a way of making a living. But it also represents one of the links in the chain of the transnational trade sector that takes place at a global scale between North Africa and South East Asia (Belguidoum and Pliez 2015, Choplin and Pliez 2015). Its development has also accompanied the economic and spatial growth of transnational trade centralities where made-in-China products are traded, al-Muski in Cairo and Medina J’dida in Oran, that have become the gateways of globalisation in marginal spaces (Mathews et al. 2012, Choplin and Pliez 2015). 11Far from being an archaic distribution system, “a large part of this economy is fully integrated in what is referred to as ‘globalisation of the economy’. This street-level distribution is actually one and, probably, the main input channel [of globalized imported goods] in the consumption patterns of the ‘poor’” (Ireton 2006: 3), that is to say the bottom of the pyramid market. From the point of view of consumers who belong to the lower classes, street vending may be the main possibility to have cheap access to globalized consumption goods and modernity. Indeed, street vendors sell a broad range of products, e.g. cheap knick-knacks and other trinkets, such as lighters, pens, hair accessories or fake jewelleries, but also few pieces of garments, sometimes plastic flip-flops and others plastic sneakers. These items are generally imported from Asia, but sometimes are made in Algeria or Egypt, and are sold at very low prices, in small or very small quantities. All these products generally are a cheaper version in price and in quality of those, which are sold inside the stores of al-Muski and Medina J’dida by ‘official’ and/or ‘formal’ traders. It shows that “street vending of these small globalized items seems to promote the development of standardized consumption patterns to lower income groups” (Ireton 2006: 5). An archetypal example of this process may be in Egypt the diffusion of Saint-Valentine’s day among middle and lower class consumers thanks to transnational trade in al-Muski market. According to the anthropologist Kreil, “the wide availability of very cheap made-in-China knick-knack has played a very important role in the success of Saint-Valentine’s day in Cairo, where these goods were widespread though all the neighbourhoods, rich or poor” (Kreil 2011: 74). Those goods – red and purple cuddly toys with red hearts, heart-shaped trinkets, etc. – have thus been distributed in al-Muski transnational trade district by “official traders”, but also on the booths and the cardboard tables of street vendors around al-Muski and through Cairo’s metropolis, thus participating in the wide success of this globalized celebration and its percolation towards lower classes. 12Many street vendors come from a lower social class or are graduates who have experienced downward social mobility (Ireton 2006, Kafafy 2016, 2017). For them, selling these made-in-China goods incorporate them into the transnational trade chain and represent the hope for a stepping-stone to a better situation, as attested by the different interviews we led with street sellers in Algeria and Egypt. As the final link in the transnational trade chain, they regularly work with wholesalers and importers from whom they purchase their small volume of goods. Sometimes, this collaboration may allow street vendors to get access to credit from these traders, and progressively allow their businesses to develop. Some of the more formal traders we met in al-Muski and Medina J’dida districts and who owned or rented a shop in the commercial marketplaces thus began their career of transnational traders as street vendors when they were young. This situation was more frequent at the end of the 1990s, when transnational trade was at its beginning and the activity then particularly flourishing. 13By locating themselves around and at the very heart of the dynamic marketplaces of Medina J’dida and al-Muski (map 3), street vendors try to benefit from the districts’ central position and famous reputation, which extends beyond the cities limits, to the region for Oran, and to the country-scale for Cairo. In addition, street vendors try to grab a bit of the wealth produced by transnational trade districts while accessing a few clients among the flows of customers that are attracted by these two commercial centralities. That is why street vendors have adopted strategies to be set up at the heart or just along the margins of two commercial centres, in order to grab the attention of the vast clientele of Medina J’dida and al-Muski. Yet, their massive presence in public space is seen both by the urban authorities and the more official traders as a sign of urban disorder whose expansion is to be regulated or even ended. Map 3. Spatial distribution of street vendors and peddlers in two transnational trade marketplaces: Medina J’dida, Oran (Algeria) and al-Muski, Cairo (Egypt). 14Indeed, street vendors still have to deal with the authorities in order to gain access to and to stay in the streets without being ousted. Considered illegal, their presence in commercial districts and in the city in general has varied, particularly since 2011, depending on the soundness of the Algerian or Egyptian state and local authorities. In Egypt, the revolutionary period, which began at the very start of 2011, opened an era of uncertainty, especially regarding the control of the city, and by extension, the control of commercial streets and their occupation. In Algeria, street vendors’ presence is a problem that is often raised by the urban authorities who try regularly to cope with it, through legal and sometimes repressive means. Nevertheless, street vendors have learnt to deal with these fluctuating and versatile public policies, and have developed strategies to stay in the streets and organize themselves – sometimes hijacking public decisions and sometimes negotiating with them. Staying in the commercial districts streets is indeed a necessity for them, because it means gaining access to potential and numerous clientele, and in turn, to revenues. 15Street vending, and more broadly, all street activities are commonly perceived as a cause of disruption of public and social order both in Egypt and in Algeria. Public authorities interpret the presence of street vendors as a challenge to their power and try to regulate, if not, to ban it. Supported by globally unanimous and negative press discourses, and sometimes by public opinion that tends to condemn street vending, Cairene and Oranese urban authorities regularly have tried to tackle the dazzling development of street vending. Besides stigmatizing discourses, they propose a repressive legal arsenal that aims at reordering public space and regulating usages and practices, in order to ban the so-called informal vending that occupies streets, pavements, and squares. Nevertheless, given the extent of street activities, urban government’s reaction wavers between de facto tolerance and spectacular acts of eviction, thanks to an arsenal of restrictive laws and measures. 16In Cairo, regulation of public space has been different before and after the revolution of January 25, 2011. Until the beginning of 2011, public space usage was regulated by the State Emergency law that forbade, among others, all rallies and in general, all manifestations on the highway (Battesti 2004). Furthermore, “the traditional policing of Egypt’s urban spaces — backed by the infamous emergency law, a huge police presence on the street and the sprawling high walls of gated communities and shopping malls — has long intimidated citizens and defined the limits of their entitlement to public space” (Abdelrahman 2013). The Peddlers/Street Vendors Law No. 33 of 1957 criminalized “peddlers who trade without a license, and prohibit[ed] vendors from selling on public transport, standing next to shops selling similar goods or in places identified by the police as needed for traffic or public security, or causing a disturbance” (Kafafy 2017: 225). Police presence, quite important under former President Mubarak’s reign, ensured regulation of public space usages, sometimes in a very violent way – among other current practices, such as racketeering street vendors in exchange of the unofficial right to public space usage, or the seizure of goods from illegal vendors caught violating the laws (Ireton 2006). After the revolution of 2011, however, the situation changed. 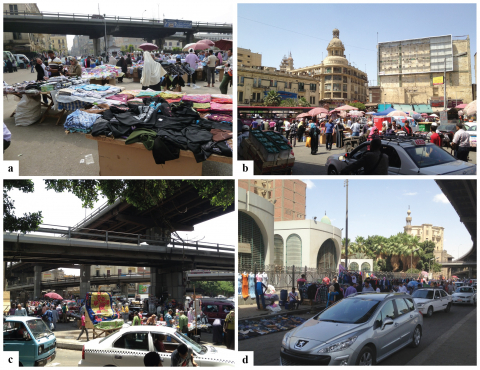 The massive influx of street vendors throughout and around Tahrir square, the epicentre of popular demonstrations, opened a new era of public space usage (Nagati and Stryker 2013). Besides the occupation of Downtown district, the very locus of the state power, street vendors intensified their presence around Ataba square and in the smaller commercial streets of al-Muski market and its surroundings (map 3), in hopes of securing a small piece of the wealth produced by the transnational trade’s district. 17In front of the spectacular spread of street vending, the state reacted immediately after Mubarak’s fall, then headed by President Morsi, as a weak attempt to re-establish its authority. As Stadnicki writes it, “Morsi’s government adopted a law that limited undeclared street vendors’ activity, but not necessarily guaranteeing any alternative for a livelihood” (Stadnicki 2015). As a consequence, Law 105/2012 was passed and increased existing punitive measures against street peddlers. Whereas under previous Law 33/1957, illegal street vending was sentenced with a one-month imprisonment and a fine of 1,000 Egyptian pounds (EGP, around 110€ in 2013), the new law enforces up to a three-month prison penalty and a fine of 3 000 EGP for illegal vending (Abdelrahman 2013). As Abdelrahman writes it, “[t]hese attempts [were] meant to restore public order to the streets and more importantly to regain the image of a powerful state and of the ‘respectability’ of Egyptian society, which, following the logic, was being threatened by the occupation of public spaces” (Abdelrahman 2013). The new government, in order to reassure its weakened authority, tried also to move around street vendors from the central districts, via a project of new urban markets in Cairo’s outskirts, with no success (Nagati and Stryker 2013, Stadnicki 2015). 18In fact, there is a significant gap between what the law provides and what is in real terms applied to Cairo’s streets. One of the last places in Ataba district where police intervened during the revolutionary era was finally the metro station located in the West part of the commercial district. As semi-closed spaces, metro stations theoretically are strictly forbidden to street peddlers. In 2012 and 2013, however, metro corridors and exits were occupied daily by individual street vendors, often children, displaying their small goods to customers on the ground. During our fieldwork, we witnessed occasional attempts from Transport Police officers to control the occupation of corridors and limit the presence of the vendors, with very limited success, since the young vendors immediately returned after they had left. 19In Algeria, in general, and in Oran, in particular, public space occupation by street vendors is regularly condemned by public authorities. In Medina J’dida, urban authorities tried repeatedly to ban their presence, or at least to limit it. The wilaya – the territorial collectivity whose head is designated by the central state –, sent the police many times during our field period in order to drive the street traders out of the main square, Tahtaha square, located at the heart of the marketplace (map 3). Police interventions aimed at evicting street peddlers from the area, seizing their goods, destroying their stands and freeing public space. Police mainly concentrated their effort on the main arteries that serve Medina J’dida, in order to give a positive image of the city, more particularly around the commemorative monument dedicated to the martyrs of the Independence war, which is located at one end of the public square. In November 2012, Directorate of Security of Oran’s wilaya launched a vast operation to “eradicate informal trade” and wipe out street vendors in Medina J’dida. As it was related in newspapers and according to one of our colleague’s testimony who witnessed the operation as a client of Medina J’dida, police officers forced the vendors from the marketplace and destroyed their stalls and their goods. The daily newspaper Le Quotidien d’Oran mentioned 160 tons of debris cleaned by the agents of the authority in charge of local public utilities and more than 310 commercial booths destroyed by the police (Djamel 2012). From November 2012, the police’s presence became more visible, as we noticed during our different moments of fieldwork until 2014, as seen in the photograph #1 below. The police marked their control of public and commercial space, pushing back street vendors inside the district and its smaller streets. Their operations progressively became more episodic, but still regular, and police trucks still could be seen in 2014 around Tahtaha square guarding the place. Photography 1. 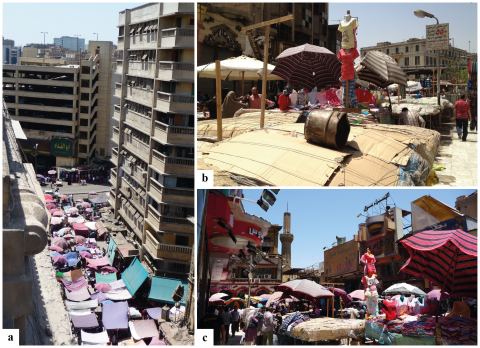 Evolution of street vendors’ occupation of Tahtaha square, Medina J’dida, between 2011 and 2013. Photo a) In November 2011, street vendors had set up booths all around Tahtaha square. Photo b) After a police raid in November 2012, street vendors had been evicted and the square was used as a parking lot by traders and consumers. Source: author, November 2011 (a) and March 2013 (b). 20Nevertheless, notwithstanding these repressive measures, sporadic police interventions, and the firmness of official speeches, street vending activities have spread throughout the marketplaces in Oran and in Cairo during our fieldwork. They actively have reshaped the commercial landscape, benefitting from the power relationships’ fluctuations between street vendors and urban authorities. 21The slightest presence of police on commercial streets and squares clearly has made easier the development of vast informal street markets in al-Muski district, and the installation of fixed or mobile booths by small street vendors along key pedestrian axes and main roads (photography 2.a and 2.b). No free space has been left. Every small place has been occupied by one or several street vendors, on the street side, on sidewalks around the big flyover piers that run over the entire district from west to east (photography 2.c). Even a mosque’s gates were used as a tool for hanging clothes (photography 2.d). Street traders aim at settling in strategic locations, where pedestrian traffic is the densest, and where cars have to stop because of a very frequent and important traffic jam, i.e., at a crossroad (photography 2.c and 2.d). Photography 2. Street vendors in al-Muski. Photos a and b) Booths and handcarts on Ataba square. Photo c) Street vendors’ booths at the crossroads between Port Said Street and al-Azhar Street, under the Al-Azhar flyover. Photo d) Use of street furniture and sidewalks by street vendors in front of a mosque, on al-Azhar Street. Credits: author, 2012 (a) and 2013 (b, c, d). Source: author, 2012 (a) and 2013 (b, c, d). 22Some of these street vendors have succeeded in establishing their activity in a more sustainable way, through the construction of real and solid street markets. One of these street markets is located all around the ground level car park at Ataba square and near the underground entrance (photography 3) where booths have been built in wood and protected from the hard sun by umbrellas or covered with cotton cloths. These informal street markets also are simple tables made of cardboard, assembling in the middle of a street, which their “owner” keeps overnight. The items are protected from dust or thieves with only sheets of cardboard or plastic bags and are under the surveillance of a private society, created by a former trader during the revolutionary era as a response to this new demand from the street vendors. Some of these cardboard tables form long street markets. That is the case of the al-Gohari souk, located near Ataba Square, in the middle of the section dedicated to women garments and accessories (photography 3 below). Photography 3. Al-Gohari street market. Photo a) Al-Gohari Street. Photos b and c) The market before the opening, on al-Isili Street: cardboards, attached with strings and maintained by weights, protect goods from dust and thieves. 23The al-Gohari souk is a very good example of how street vendors have learned how to benefit from the relaxation of the police control on public space usage by maintaining and even reinforcing their presence in al-Muski district. It also illustrates the fluctuation of power relationships between street vendors and urban authorities, directly linked to the evolution of state power, and the effects of the revolutionary period. This very popular souk, organized by vendors originated from the Upper region, is a very old street market near al-Ataba square. It has been under a constant threat of closure since 1954, with former President Nasser’s decision to make the district accessible by car. After half a century of indecision, the market was closed in 1993. Yet in 2002, a court decision, after having confirmed the first decision to close the market, imposed the opening of a new marketplace, organized and formally managed, in order to replace the previous location. The market was then removed from al-Gohari Street to Zawiya al-Hamra district in the north of Cairo. However, in this new market, only traders who were officially registered could pretend to buy or rent a new booth to Cairo governorate, the owner of the new market. It meant that only a few of the vendors could be reinstalled because the majority were undeclared. Those who remained without a local business came back in al-Muski streets, under the constant threat of a police control that could be a devastating blow for business. For example, we were told that, at that time, street vendors had to constantly negotiate their place with local police officers and had to regularly pay bribes, up to 200 EGP, so as not to see their goods being seized by the police. The amount of the bribe would increase if they could not immediately pay the police, and had to pay back the items that had been confiscated. Vendors also would bribe local administration agencies in order to gain the “right” to occupy the street, but they had to pack every night their booths in order to free the street, under the pressure of the local administration. 24With the revolution, the situation completely changed. Police officers disappeared from the smallest streets of al-Muski district in 2012 and 2013. This was a result of the police’s fear of popular disapproval. Officers then simply patrolled the main streets in order to ease traffic circulation and prevent informal vendors from hampering the flow of traffic. Because of the absence of police officers and local administration, the vendors of al-Gohari souk could henceforth keep their tables with their items on it, protected by cardboard as the photographs show above, all-night long under the surveillance of a security agency, a service for which they paid between 2 to 5 EGP per table. At last, according to the vendors themselves, regular bribes to police officers and local administration agencies disappeared with the erosion of local and central state, at least during the three years of local power vacuum. 25Al-Gohari market is thus a very good example of how ordinary agencies develop know-hows and take advantage of the disappearance of public authorities. Small and informal traders have succeeded in developing their business through the commercial streets of al-Muski, a situation that runs counter to public authorities’ discourses and their will of controlling the commercial city and regulating its practices and usages. 26In Oran, regular lightning police operations and police surveillance in Medina J’dida’s main streets have not been followed by the disappearance, nor the diminution of street vending activities in the commercial district. Public authorities had to recognize the impossibility of completely banning it, since informal trade is a significant source of income for a large part of the population. Authorities finally offered a compromise to street vendors. During a meeting organized at Oran town hall in June 2012, the wilaya’s Head of security and the Mayor of Oran announced that street vendors were authorized to stay inside Medina J’dida, but that they were refused access to Tahtaha square, in order not to affect traffic circulation and parking (Benmaras 2012). In exchange, informal traders could settle themselves inside Medina J’dida district, along the smaller streets that are de facto dedicated to pedestrian circulation during the day. Some of the informal street vendors previously settled around Tahtaha Square largely obeyed, but the immediate result was a lack of space in these streets for pedestrian circulation, particularly at the peak of frequentation. 27A national-scale program also was launched during the latter part of 2012 and foresaw the construction of markets of proximity, also called “Parisian markets” due to their colonial origin. These markets aim at hosting informal street vendors by giving them a commercial license, a commercial business at affordable prices and both social and spatial stability. In Oran, under the control of the Head of the economic activities direction (DAE in French for Direction des activités économiques), an ad hoc committee was established in association with diverse public partners from national to local levels. The mission of this committee was to identify places in Oran that could host these covered markets to-be, a list of locations that had to be confirmed by the Ministry of Interior, which had the final decision and would fund this urban and commercial policy. Meanwhile, municipal authorities would encourage the street vendors to organize themselves in a professional association in order to have the right to ask for a commercial space in these future markets. 28During our fieldwork in spring 2013, more than 1,400 street vendors had registered to this program in Oran. This situation raised the question as to whether public authorities were able to meet this enormous demand. Moreover, the national program in Oran foresaw the construction of seven markets of proximity, all of them located in Oran’s suburbs. 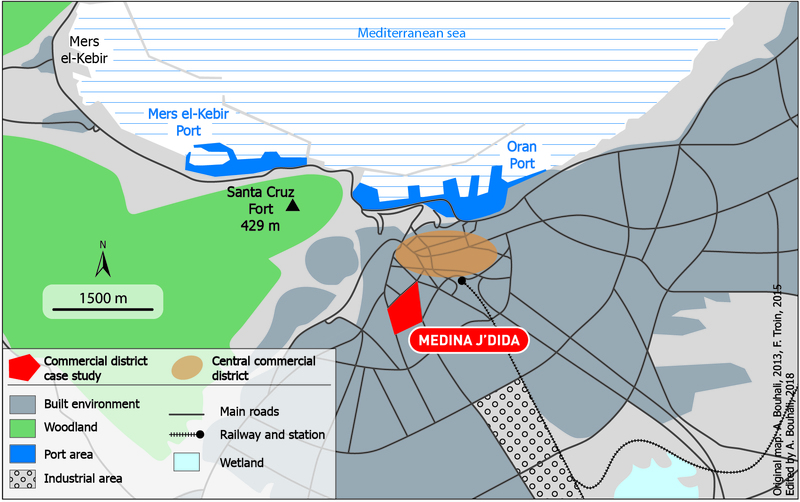 Nevertheless, the two more important commercial districts of Oran metropolis, Medina J’dida and Larbi Ben M’Hidi central district, are both located at the city centre (Bendjelid and Trache 1999, Trache 2010). Thus, for the formal-to-be small traders, being settled in the suburbs would mean being cut from more important parts of their daily and usual clientele. Consequently, that brings to the question whether the street traders would really benefit from this policy and use their commercial space, not to mention the problem of this policy funding, and its sustainability (Reguieg-Issaad 2016). 29These two situations show the irregularity of urban authorities’ power on their streets and the capacity of small and informal traders to take advantage of state disappearance or laisser-faire. Nevertheless, the street vendors’ situation can be rather precarious, for a brutal shift from the state and/or the urban authorities remains possible at every moment. 30Besides dealing with urban authorities, street vendors also have to deal with the traders who have ownership of the shops and other commercial centres in front of which the former settle. Traders running a shop, formally or not, in general have a negative view of these vendors whom they blame for unfair competition. Relationships between traders and street vendors usually vacillate between de facto acceptances, and sometimes, open conflicts in relation with spatial competition. 31As the commercial street is an important spatial resource for every vendor, and as gaining access to these marketplaces means gaining access to flows of consumers (Steck 2006), street vendors have to negotiate the use of commercial streets with those whose degree of informality is less visible. Traders may not have paid for an official commercial license, but they are owners or tenants of a shop and do not work in the streets. For this reason, they are more powerful than street peddlers are, and are not, or more rarely, under the threat of local administration agencies or the police. Taking this into consideration, the relationships established between these two types of traders is not only based on rivalry and conflicts. It can also be a collaboration with one benefitting from the presence and the activities of the other. 32First, street vendors buy their small and globalized items from importers or wholesale traders from al-Muski and Medina J’dida, because that is where they can find the most important concentration of products and companies specialized in these categories of products. 33Be it in Oran or in Cairo, patronage and dependency relationships exist between traders running a shop and informal street vendors. What is at stake is the possibility for the street vendor to settle and occupy a part of public space, that is to say the pavement or a small part of the commercial street, which is appropriated by the traders who consider it as a real part of their commercial space, and may “rent” it to street vendors in return for small services. For example in Medina J’dida, between summer 2012 and spring 2014, we regularly witnessed the relationships, made of patronage, between a store manager specializing in women garments and diverse street vendors who worked every day in front of his shop or besides it. One of the street vendors was a 50-year-old man, specialized in small school supplies, e.g. handbooks, pencils and other colouring books. He set up his small stand just besides the front steps of the manager’s shop in exchange for services: he got coffee for the manager, he went shopping for him, or he monitored the shop while the other took a break. By doing this, he assured him his place in the street and was sure to have it back every morning. He also could use the manager’s shop as storage for his items at night. The other street vendors, youngsters in their twenties, who worked just across the street, often sold products of the manager at discount prices, thus making a very small profit on the items. This was useful for the manager, who could get rid of his stock. This description is one example of the little arrangements that exist between “official” traders and street vendors, in exchange for the right to access to commercial streets. This “right” of course does not belong to shop traders, but they informally take control of the streets. 34Sometimes, some merchants try to make a stand against, or at least interfere with street vendors’ presence by using the street in front of their shop as an additional retail space for their own goods. This will help them to prevent the street peddlers from setting up their booths or their cardboard stands. This situation is very common in al-Muski Street in Cairo, the main and more dynamic commercial artery of the district (map 3), where an important part of the market stalls are appropriated not by vendors but by the shops they are located in front of. Street vendors do not have access to this extremely dynamic commercial street, but they are “free” to set up their business in the largest streets where they build another range of informal shops without offending the shops managers. In Medina J’dida, the booths draw another range of commercial shelves in the main commercial streets of the district: on the Rue du Figuier (Fig Tree Street), in front of the multi-story carpark under construction right in the middle of the district, or all around Sidi-Okba food market (map 3). In this area, the street stands are so numerous that they impede pedestrian circulation, particularly at peak hours. 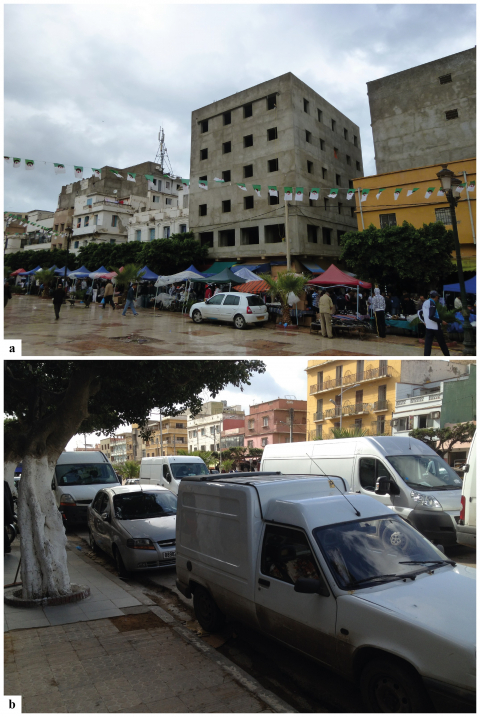 Algerian street vendors also use residual urban spaces – i.e., in front of the parking lot in Medina J’dida, or on top of a rundown building in front of Sidi Okba food market, – pavements along public buildings, or even along derelict flour mills located in the core of the district. At al-Muski district, metal blinds of closed stores are used as showrooms by small street vendors, as well as the façade of the Alexandria Bank agency right in the middle of al-Muski Street (photography 4). By disposing their goods in front of an abandoned shop or an official building, street vendors may avoid the wrath of the entire commercial neighbourhood. Photography 4. Bank of Alexandria’s façade in al-Muski Street: an original exhibition place used by a female street vendor. 35Nevertheless, despite many strategies implemented by street vendors both in Cairo and Oran’s streets to ensure themselves access to a location in the commercial districts with as little tensions as possible, conflicts may arise between them and official traders. In Medina J’dida for example, some traders regularly and extensively complained about the vendors’ presence along or in front of their stores. Before the forced displacement of street vendors from Tahtaha square in autumn 2012, traders who said they would suffer the most from street vending activities were also those selling products of the same low quality and the same geographical origin as the goods proposed by street vendors, e.g. garments and fashion accessories of medium or low quality and made-in-China. In other words, traders saying they were negatively impacted by street vending were the smallest traders of the marketplaces. They are retailers, and are the most vulnerable to commercial competition because their margins are much smaller, and because they target the same poorest consumers as street vendors. The bigger traders specializing in upmarket products or in traditional products imported from Morocco, e.g. wedding gowns and other caftans for celebration, did not complain and seemed non concerned by the threat of small scale trading on the sly. Tensions between these two groups of agencies reached its peak with the mobilization of the traders who rented or owned a shop in the old covered market of el-Kettane, located in front of Medina J’dida district (map 3). Established in 1956, this market still is the property of Oran Municipality (APC, for Assemblée populaire consultative), and specializes in made-in-China clothing for the entire family. The tradesmen association of el-Kettane market had been pressuring Oran Municipality for a decade, in order to oust informal street vendors who had set up their booths at the doors of the market. One of the traders, a member of the professional association of the market, insisted during one of our interviews that souk el-Kettane had been in great difficulty for a couple of years. On the one hand, this was due to sharp competition with the street traders, and on the other hand, because of the commercial boom encountered by Medina J’dida, which had obliterated the covered market. Not to mention the additional threat posed by the urban development projects of Oran Municipality which envisioned replacing the municipal old marketplace by a new and modern commercial centre. The association of the souk al-Kettane managed, nevertheless, to drive the street peddlers out of the neighbourhood thanks to police intervention in November 2012, and regular surveillance operations since then – a situation, which the head of the association welcomed with great satisfaction and a bit of relief during our interview in March 2013. 36Relationships between official traders owning or renting stores and informal street vendors are thus very complex; they may be made up of negotiation and de facto tolerance, but also, sometimes of open conflicts. In Medina J’dida’s case study, traders finally requested the urban authorities to intervene in their open conflict with the small vendors, a situation that perfectly illustrates the ambivalence of relationships between ordinary agencies and public authorities. What is finally at stake is the control over commercial space and, therefore, over potentially high revenues. It also is a question of power upon space: who has the power to manage access to the commercial street and to control the informal settlement inside the marketplaces. The result of this power struggle is specific alliances building between the diverse agencies inside the two marketplaces. 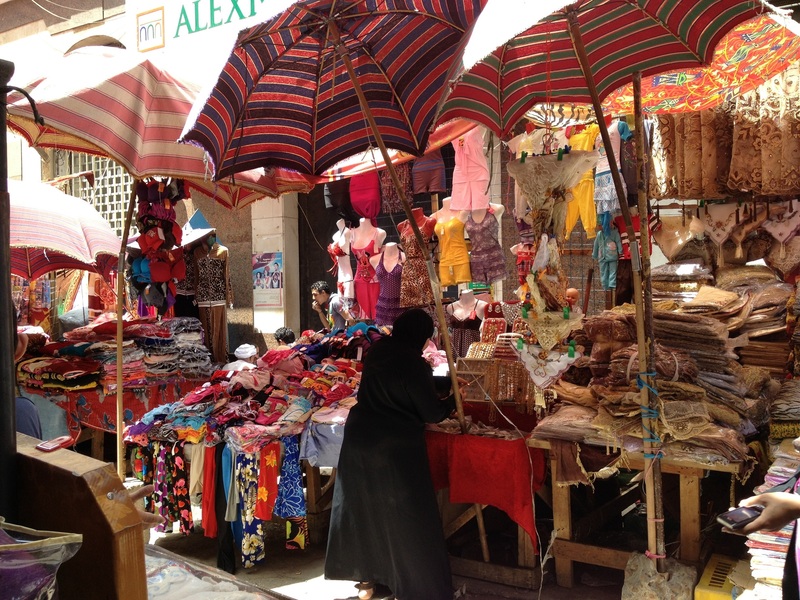 37Street vendors and their relationships with the Algerian and Egyptian states and the shopkeepers provide evidence of a “place struggle” (Lussault 2009) at play in the commercial streets in al-Muski and Medina J’dida. Despite their lack of conventional sources of power, the former negotiate their place in the commercial city, and “use location-specific tactics to circumvent restrictions and maintain their business” inside the transnational trade marketplaces (Graaff and Ha 2015: 6), though under precarious and very poor conditions. Street peddlers and vendors of al-Muski and Medina J’dida thus exemplify the “quiet encroachment of the ordinary people” analysed by Bayat (2010: 14), that is, “non-collective but prolonged direct actions of dispersed individuals or families to acquire the basic necessities of their lives (land for shelter, urban collective consumption or urban services, informal work, business opportunities, and public space) in a quiet and unassuming illegal fashion” (Bayat 2010: 45). This notion “describes the silent, protracted, but pervasive advancement of the ordinary people on the propertied, powerful, of the pubic, in order to survive and improve their lives” (Bayat 2010: 56). In our cases, street vendors encroach both on the public space, thus facing the various reaction of urban and state authorities, and on business opportunities created by shopkeepers, raising sometimes their ire, in alliance with the state, sometimes their collaboration and more or less passive acceptance. 38Despite of their visibility and their spatial importance, street trade activities inside these two urban marketplaces are still under the threat of a possible turnaround of the state authorities. As we demonstrated, the authorities has been wavering between tolerance and violent and sudden interventions to restore the public order that street vendors are regularly been accused of disrupting. Whereas “the ‘soft’ and vulnerable states, especially at times of crisis, tend in practice to allow the encroachments when the latter appear limited” (Bayat 2010: 61), this fragile tolerance might shatter at any moment, “with tremendous impact on vendors for whom public space represents an indispensable resource of income” (Graaff and Ha 2015: 5). The eviction of street traders from the very centre of Medina J’dida in November 2012 is but one example. In Egypt, an important state crackdown has occurred after the period of our fieldwork at the beginning of 2014, with the restoration of the old military and ruling elites thanks to the coup of Field Marshal then elected President el-Sisi. By a spectacular turnaround, the Egyptian state decided to regain control on the civil society through a tighter and tough control of public space aiming at the restoration of public order. This has resulted, amongst other things, in the massive eviction of street vendors from the city centre (Abaza 2014) and from al-Muski main commercial streets. It seems that, through the cracking down of a popular and commercial centrality, the state sought to re-establish a social, economic and political order. Subduing the commercial city and its public space would thus signify controlling urban order and the city at large. As Graaf and Ha underline it, “by using space to survive better their living conditions, vendors demonstrate how the city, in particular the street, is a concrete space for politics” (Graaff and Ha 2015: 7), thus showing that street vending is not only a daily activity that allows to cope with socio-spatial injustices, but also is a politicised practice. Abaza M. 2014. Post January Revolution Cairo: urban wars and the reshaping of public spaces. Theory, Culture & Society 31(7-8): 163-83. Abdelrahman M. 2013. Ordering the disorderly? Street vendors and the developmentalist state. Jadaliyya (blog) www.jadaliyya.com/pages/index/9542/ordering-the-disorderly-street-vendors-and-the-dev (Retrieved January 14, 2013). Angel-Urdinola D, Tanabe K. 2012. Micro-Determinants of Informal Employment in the Middle East and North Africa Region. Washington: World Bank. Battesti V. 2004. Des espaces publics au Caire: les jardins publics, in Puig N, Peyronnie K, CD-ROM, Bondy, IRD: 9. https://halshs.archives-ouvertes.fr/halshs-00004009v2 (Retrieved July 26, 2016). Bayat A. 2010. Life as Politics. How Ordinary People Change the Middle East. Amsterdam: Amsterdam University Press. Belguidoum S, Pliez O. 2015. Made in China. Commerce transnational et espaces urbains autour de la Méditerranée. Les Cahiers d’EMAM. Études sur le Monde Arabe et la Méditerranée, no. 26. http://emam.revues.org/909 (Retrieved August 17, 2017). Bendjelid A, Trache SM. 1999. Les structures commerciales et les dysfonctionnements intra-urbains dans la ville d’Oran. Es Senia University, Oran. Unpublished report. Benhabib L. 2014. Le chômage des jeunes en Algérie: l’enjeu des inégalités de diplôme et de genre. Paper presented at the 20th ATM Development Days, Marrakech, 29-31 May 2014. Berry-Chikhaoui I, Deboulet A (eds.) 2000. Les compétences des citadins dans le Monde arabe. Penser, faire et transformer la ville. Paris, Karthala. Blot J, Spire A. 2014. Déguerpissements et conflits autour des légitimités citadines dans les villes du Sud. L’Espace Politique 22 (March), http://journals.openedition.org/espacepolitique/2893 (Retrieved December 06, 2017). Bouhali A. 2016. Fabriquer des centralités marchandes dans le monde arabe. Étude comparée de deux quartiers-marchés du commerce transnational au Caire et à Oran. Toulouse, Toulouse 2 Jean-Jaurès University, unpublished PhD diss. Brown A (ed.) 2006. Contested Space: Street Trading, Public Space, and Livelihoods in Developing Cities. Rugby, Practical Action. Brown A (ed.) 2017. Rebel Streets and the Informal Economy: Street Trade and the Law. New York, Routledge. Brown A, Kafafy N, Hayder A. 2017. Street trading in the shadows of the Arab Spring. Environment and Urbanization 29(1): 283-298. Cairo Post. 2014. Youth unemployment rises to 29% in 2014, http://thecairopost.youm7.com/news/121714/news/youth-unemployment-rises-to-29-in-2014-capmas (Retrieved August 13, 2014). Chen M, Roever S, Skinner C. 2016. Editorial: Urban livelihoods: reframing theory and policy. Environment and Urbanization 28(2): 331-342. Choplin A, Pliez O. 2015. The inconspicuous spaces of globalization. Articulo – Journal of Urban Research 12, http://articulo.revues.org/2905 (Retrieved July 22, 2016). Daguzan J-F. 2009. L’Algérie face aux crises. Maghreb - Machrek 200(2): 9-14. Darbon D. 2013. Classe(s) moyenne(s): une revue de la littérature. Afrique contemporaine 244(February): 33-51. Djamel B. 2012. Mdina Jdida: 310 auvents et marquises démantelés hier. Le Quotidien d’Oran, November 13, www.lequotidien-oran.com/index.php?news=5175437 (Retrieved July 21, 2017). Dris N. 2002. La ville mouvementée: espace public, centralité, mémoire urbaine à Alger. Paris, L’Harmattan CEFRESS. Dris N. 2016. Introduction. Repenser l’espace public à l’aune des transformations sociales contemporaines. Les Cahiers d’EMAM. Études sur le Monde Arabe et la Méditerranée 28, https://emam.revues.org/1194 (Retrieved July 31, 2016). Gana-Oueslati E, Moisseron J-Y. 2010. La crise ou la fin du mythe de l’émergence en Égypte / The Crisis or the End of the Myth of the Emergence in Egypt. Maghreb - Machrek 206(4): 17-39. Gatti R, Angel-Urdinola D, Silva J, Bodor A. 2014. Striving for Better Jobs: The Challenge of Informality in the Middle East and North Africa. Washington, World Bank. Graaff K, Ha N. (eds.) 2015. Street Vending in the Neoliberal City. A Global Perspective on the Practices and Policies of a Marginalized Economy. New York, Berghahn. ILO. 2015. Global Employment Trends for Youth 2015: Scaling Up Investments in Decent Jobs for Youth. Geneva, International Labour Office. Ireton F. 2006. Les vendeurs de rue de petits objets semi-durables “globalisés” au Caire: premiers résultats de recherche. Le Caire, CEDEJ. Kafafy NA. 2016. Right to urban space in post-revolution Cairo: a study for street vending phenomenon, in Attia S, Shabka S, Shafik Z, Ibrahim A (eds.) Dynamics and Resilience of Informal Areas. Springer, Cham: 97-112. Kafafy NA. 2017. Street traders in post-revolution Cairo. Victims or villains?, in Brown A (ed.) Rebel Streets and the Informal Economy. Street Trade and the Law. New York, Routledge: 220-235. Kreil A. 2011. La Saint-Valentin au pays d’al-Azhar. Éléments d’ethnographie de l’amour et du sentiment amoureux au Caire, in Gross M, Mathieu S, Nizard S, Godelier M (eds.) Sacrés familles! Changements familiaux, changements religieux. Toulouse, Erès: 71-83. Lussault M. 2009. De la lutte des classes à la lutte des places. Paris: B. Grasset. Madœuf A. 1997. Images et pratiques de la ville ancienne du Caire: les sens de la ville. Tours, François-Rabelais University, unpublished PhD diss. Mathews G, Ribeiro GL, Vega CA (eds.) 2012. Globalization From Below. The World’s Other Economy. London, Routledge. Nagati O, Stryker B. 2013. Archiving the city in flux. Cairo’s shifting urban landscape since the January 25th Revolution, https://issuu.com/clustercairo/docs/archiving_the_city_in_flux (Retrieved March 11, 2016). Olivier de Sardan J-P. 1995. La politique du terrain. Sur la production des données en anthropologie. Enquête. Archives de La Revue Enquête 1: 71-109. ONS. 2014. Activité, Emploi et Chômage Au 4ème Trimestre 2013. Données statistiques Emploi et chômage n°653. www.ons.dz/img/pdf/donnees_stat_emploi_2013.pdf (Retrieved July 21, 2017). Peraldi M (ed.) 2001. Cabas et containers. Activités marchandes informelles et réseaux migrants transfrontaliers. Paris, Maisonneuve et Larose, Maison méditerranéenne des sciences de l’homme. Peraldi M. 2007. Aventuriers du nouveau capitalisme marchand. Essai d’anthropologie de l’éthique mercantile, in Adelkhah F, Bayart J-F (eds.) Voyages Du Développement. Émigration, Commerce, Exil. Paris, Karthala: 73-114. Pliez O. 2007. Des jeans Chinois dans les rues du Caire, ou les espaces discrets de la mondialisation. Mappemonde 88 (4-2007), https://mappemonde-archive.mgm.fr/num16/articles/art07404.html (Retrieved July 21, 2017). Pliez O. 2012. Following the new Silk Road between Yiwu and Cairo, in Mathews G, Ribeiro GL, Vega CA (eds.) Globalization From Below. The World’s Other Economy. London, Routledge: 19-36. Prahalad CK, Hart SL. 2002. The Fortune at the Bottom of the Pyramid. Strategy+Business 26(first quarter): 2-14. Reguieg-Issaad K. 2016. 4 000 commerçants informels ‘légalisés.’ Liberté Algérie, December 22. www.liberte-algerie.com/ouest/4-000-commercants-informels-legalises-260973 (Retrieved December 12, 2016). Roever S, Skinner C. 2016. Street vendors and cities. Environment and Urbanization 28(2): 359-74. Signoles P, Kadi GE, Boumediene RS. 1999. L’urbain Dans Le Monde Arabe. Politiques, Instruments et Acteurs. Paris, CNRS Éditions. Skinner C. 2008. Street Trade in Africa: A Review. Wiego Working Paper No 5, October. Souag A, Adair P, Hammouda NE. 2016. L’emploi informel en Algérie: tendances et caractéristiques (2001-2010). MECAS 12(June). https://hal-upec-upem.archives-ouvertes.fr/hal-01667432 (Retrieved January 11, 2018). Souag A, Assaad R. 2017a. The Impact of the Action Plan For Promoting Employment and Combating Unemployment on Employment Informality in Algeria. Economic Research Forum (ERF), Working Paper Series, no. 1161. Souag A, Assaad R. 2017b. Labor Market Program and Informality in Algeria, http://erf.org.eg/wp-content/uploads/2017/03/Lbr_ERF23AC_RaguiAli.pdf (Retrieved January 11, 2018). Stadnicki R. 2015. Les Frères musulmans au pouvoir et la question urbaine en Égypte: un rendez-vous manqué? Les Cahiers d’EMAM. Études sur le Monde Arabe et la Méditerranée 27. https://doi.org/10.4000/emam.1134 (Retrieved March 3, 2016). Steck J-F. 2006. La rue africaine, territoire de l’informel? Flux 4: 73-86. Talahite F, Hammadache A. 2010. L’économie algérienne d’une crise à l’autre / The Algerian Economy, from one Crisis to another. Maghreb - Machrek 206(4): 99-123. Trache SM. 2010. Mobilités résidentielles et périurbanisation dans l’agglomération oranaise. Oran, Es-Senia University, unpublished PhD diss. Volpi F. 2013. Algeria versus the Arab Spring. Journal of Democracy 24(3): 104-15. Volpi F. 2015. Stabilité et changement politique au Maghreb: Positionner l’Algérie dans le contexte régional de l’après-printemps arab / Stability and political changes in the Maghreb: Algeria in the post-arab spring regional context. Maghreb - Machrek 221(3): 35-46. Creative Commons 3.0 – by-nc-nd, except for those images whose rights are reserved. What do Images in the Public Space do?